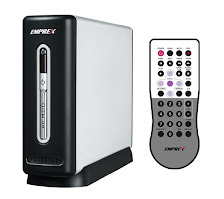 Emprex ME1 - HD Multimedia Enclosure: Easy way to enable Samba server, Mldonkey, Gmedia Server and SSH at bootup. I notice that the Debian file is called "d3g.ext2". Will this work with the new firmware? I have upgrade F/W to 1.08 and installed the image, all functions work for me. Have you try to browse PC by ME1 to check if it's the network issue ? installed the new version, and everything works as they show... thanks EMprex. when i telnet, after i type in root at the venus login, i get a warning "cannot change to home directory" at the prompt (/ #) i type in as shown and get this: "-sh: /usr/local/etc/hdd/volumes/HDD1/first: Permission Denied. any ideas ? i have updated the firmware before trying this. I guess you have used previouse SambaServer to transfer files instead of using a USB flash device. no, i have not been able to install any samba server. i un-zipped all files then transfered to me1 using usb. i have also the problem with permission denied...who can i solve this problem? Thanks for your help! Hi, did anybody know how to stop the DvdPlayer process from telnet window? It will probably improve transfer rate via LAN/samba interface. Simple "kill" command not give expected effect, even after deleting the ./tmp/lock/.DvdPlayer file. Any ideas? I want to connect my ME1 to my Macbook via my Netgear router. I've tried following the steps for Samba but the instructions are for PC nd I dont know enough about networking the do it the Mac way. Does anyone have any ideas or instructions to get it to work. I use it with my Macbook, but for some reason osX won't allow anonymous access. You need to edit smb.conf (on the ME1) to change to user level access. My me1 is in the caravan (use it to take all my films on holiday!) but I can send you my smb.conf in a couple of days when I fetch it back. I installed the latest firmware and the Samba image without any problems and managed to access MLDonkey using both the web interface and Sancho. I had to put the IP address of my ME1 into the DMZ of the router for it to pass the porttest and be able to download torrents. At first it was running fine, but after a while downloading slowed down and the web interface became extremely sluggish and I couldn't connect to mldonkey using sancho anymore. The only settings I adjusted were clientIP (first to my IP, then to the ME1 IP) and download speed (to 0 for unlimited speed). Is it possible to use port forwarding instead of using the dmz? What do you set the client IP to (or do you leave it as default 127.0.0.0)? What could be causing the web interface to be sluggish? I changed my client_IP back to the default, 127.0.0.1, the web interface is running smoothly again. It is possible to use port forwarding, just set up port forwarding for port 6882 to enable bittorrent downloading. I saw this blog months ago and it put me off the EM1 cos of the samba issues. Look at it now! its a worthy piece of media kit, and 4 of 'em are going in all of my kids bedrooms, hey ho, they can even take em to their mates. And with DC power and NTSC/PAL output it should work anywhere in the world so long as i've got the cables. There aren't that many companies listen to their customers. Now, hows that search/scan feature coming along? thats a pretty mandatory feature for any VIDEO player. I just realised, not only can they do all of that, but they should all see each other on the LAN too! Hi, thanks for the Samba/mldonkey/SSH Install Stuff.... Brilliant!!! makes me feel ive got my money worth!! I have a question that I hope someone can answer please. 1. I started downloading a 4.1 gig torrent (multiple Avi files) and I looked in the Fat32 partition with samba and I cant see the current files that are being downloaded. My questions is: are the files saved to the 4 gig ext2 partition whilst still downloading? If so, will the download fail with lack of diskspace due to the max file size of fat 32 being 4 gig? 1- In the INPUT field at the top of the interface type: "enable 1" (without the quotes) and hit Input button. 3 - Test again and troubleshoot as required. the mldonkey web interface might be sluggish after you start downloading torrents due to the fact that there is a lot of hashing going on. the Me1 system is set to prioritize the decoding of video, so any other processes on the box will run at lower priority. It might be possible to change this, but I dont know how. suggestions and /or corrections welcome. If you use Sancho, you will have a better experience! It is also easier to change mldonkey options with sancho so you can fine tune it to your desires! What does installing Samba server do? Does this allow other computers on the network to see the ME1? UPDATE: Hi guys, here is an update on my findings. A few days ago i asked what the maximum download size in mldonkey would be... I now know that if the settings are left as default, you will not be able to download more than 3 gis or so. this is because the TEMP folder resides in the ext2 file on the hdd (the debiam partition) and it has a max size of 4.1 gig as per the fat32 spec. As the entire debian is aldo in this file, there is less space than one would desire, seriously limiting the number /size of the torrents you can download. After a reboot, i started a new torrent dl and checked my new temp folder on the hdd and voila! temp files now downloading to a temp folder in the fat32 partition. Also, there is a slight increase in performance overall. P.S. Perhaps Mr Emprex can make a rebuild with this new setting as default ;) that would be excellent! Hi all. Today I just wanted to let you know a little secret. I have been playing around with the ME1 and the Mldonkey stuff for a fews days and I got to a point of terrible frustration due to its performance. I just could not figure out why the ME1 was grinding to a halt, taking about 30 minutes to fully boot, bittorrent download speed was horrible and there was way too much disk activity!! After alot of sweat and tears I have figured out that when you boot the thing up mldonkey simply does not work right. To resolve the issue this is what I now do to keep it working ok . The only reason I can think of that causes the behaviour is the auto start scripts running to early, whilst the ME1 is booting. I am no unix guru and certainly not an mldonkey expert, so if someone can enlighten us as to why this is happening, im sure we will all have a better experience. I am really glad that this "hack" exists and want to thank all the people that put in the hours to make installing mldonkey, samba and ssh on this device possible. Ill keep you all posted with more news soon. The problem is mldonkey wont stop when u power off from remote controller. So u can try telnet to ME1 and type #reboot , the mldonkey ME will reboot and the mldonkey will reboot too. 'chroot: cannot execute /etc/samba/chmod.sh: no such file or directoy' error just before it reboots. Any suggestion where I'm going wrong? Hi, my ME1 has locked up a few times and I think it might since installing Samba (I have disabled the other services)... is there anyway I can completely remove it to test and see if it's Samba causing the problems? I'm trying to install MLDonkey/Samba on a 1.08 firmware but I have an Permission Denide error like some others before. The chmod din't help. Any other idea what can I do ? I uploaded unzipped "firs" via USB from my PC and disconnected, all the rest i do by telnet. Maybe I'm doing something wrong ? in a directory called "first" or just under the root of the drive? prompt, I get the message "warning: can't change to home directory". Is this the expected response or an error? Those service wont start anymore. dg.ext2 fails the CRC check when I try to uncompress the .rar files on a Linux system. Any chance of uploading the archive in a modern format, like bzip2 or even pkzip? This is an excellent use of the ME1 hardware. have it running in the corner of the room where it's hardwired into my router. one question (though it might have many facets). if i were able to put my debian image onto a 8 or 16gb flash drive, would i be able to run the image from there? I'm thinking that if that flashkey were formatted ext3 it might be able to get around the >4gb limit. Also would that stop the drive spinning constantly in the ME1 enclosure and help to keep the heat down? If flash drive formatted to ext3 , we can download over 4g file. But swap will keep hard disk spinning. If the dvdplayer process can be terminated.Maybe there are enough memory for mldonkey . try "stopall" to terminate all processes. Hi. Just got an ME1 and glad I've found this site as I was having problems connecting via ethernet but your advice has solved that now. I can view files on my computer and stream them on the ME1. But I can not view any recorded files on the ME1 from my computer. How do you transfer files recorded on the ME1 to a computer? Thanks. I have figured out how to do it via title edit and usb, but would like to do it via ftp from the HDD1/REC directory so that I don't have to stop using the box when using USB. If you have installed Samba server, then modify samba.sh and smb.conf in order to access the recording partition from net. I havent been able to install Samba yet. Bit too technical for me. Was hoping for a step by step guide. I tried installing Samba via usb but am geuing the Permission denied problem. The chmod command doesn't solve it. What else do I need to do? I have figured out that the first file is running but the "mount" command isn't working and the "chroot" command is where the "permission denied" error is happening. Not sure if the PATH is correct or Mount command not working for some reason? OMG finally got it working and such a simple mistake. I put the files in HDD1/first instead of the root. Using my work PC, which is run Windows XP Professsional. Accessing "File://x.x.x.x/" it asks for a password for Guest login. What is this password? Looks like Samba is not installed or not enabled. Password is not required if you install this image. Only question is how can I get access to the external drive too? I confirm the password problem too when trying to access from a PC logged under some domain. - I tried with my work PC (CompanyDomain) => asked for a password. - I tried with my daughter's PC (workgroup) => everything fine ! Thanks BTW for your great work ! Hi all, got one of these recently, transffered around 97 .avi files direct to installed HDD, to view when required - installed samba and have network connection now, only now i have problem; when i try to watch the installed .avi's using browser/hdd the list at bottom of screen appears with my files but the ME1 just locks with 'loading' message or if I try playback i get same error!!! I have to switch of at mains to reset, any advice would be great! Try to disable preview to speed up file loading in Browser menu. What is the error message when you play the AVI you have ? Do you know what kind of codec is used for the AVI ? Downloaded the samba server files via your link but every time I try to unzip them I get a "write error in the file d3g.ext2. Probably the disk is full but it isn't! The file you downloaded must be corrupted or damaged. Or the unzip tool you are using is the problem. Not sure where but remember someone mentioned that using Linux unzip tool unable to unzip the file successfully. Unzip problem solved by redownloading and using computer the next day! Can't imagine why. Now I get the /usr/local/etc/hdd/volumes/HDD1/first: Permission denied problem. I can browse my network from the Emprex box. Have you copy all unzip files to root directary of hard disk ? Someone has the same problem and it's due to incorrect directary. Does this work with F/w 2.08? Yes, it works for firmware 2.08 as well. Having downloaded the Samba etc patch, I'm stuck at the point of unzipping it. I have 6 files: first.part001.rar, first.part002.rar, first.part003.rar, first.part004.rar, samba.sh and smb.conf. How do I "unzip" these? WinRAR tells me: "The archive is either in unknown format or damaged." Maybe I don't decompress them? Is it THESE files which are copied directly tot eh FAT32 partition on the ME1 as is? Both ways should result the same, unzip .rar straight to ME1, or copy all rar files to ME1 and unzip it. Just want to ask if the hacks posted on this blog would also work on the Emprex ME3 HD multimedia enclosure? It works for ME3 since they are using the same system. J can't download image samba on windows live where J can get samba? Upgraded my ME1 to latest firmware MEC_P0.31.K1 from the Emprex site. Just tried the Samba image from this blog (my first try of Samba) - I found instructions very clear, many thanks. Anyone else tried it ? My ME1 is now running like a dog with one leg. Both on screen menu and telnet (from XP) both very slow / unresponsive. I've heard that this new firmware hogs most of the available rom - could this be the problem - any ideas or other experiences gratefully received. Would like to avoid having to buy a dedicated NAS (another box plugged in). MlDonkey takes a lot resources, if you don't it just close it. Would be nice to keep Mldonkey but if it solves the problem I'll let it go - does it use a lot of resources even when not set tasks (search or download) ? How about G media - s that resource hungry too. One thing I have also noticed is that the harddisk is busy thrashing away even when the ME1 is not doing anything - no AV input to cache for example. I have now removed everything bar samba and it is running better. However I cannot write to the ME1 across the network - clearly a permissions problem but all my attempts to rectify this have failed. I can see the data and access it across the network. I can login to Venus. I have full USB access read and write. I am running the latest (dec08) firmware. Is there anyone who can help - if so let me know what info I need to provide. For some reason, I am getting many input/output errors. I had difficulty copying the ext2 file over as well. This may be the result of how the file is compressed. Would it be possible for someone to zip using some other compression? Is there anything special about this filesystem? Could we just use any mips tarball or is there some special drivers? Can someone post the samba image files necessary to install this on another download location. Try as I might from various pc' I can't get the download for each file to start. I just end up with a blank internet explorer window. Can someone tell me how I can get Samba to mount HDD2 instead of HDD1? I have tried modifying the "first" file but it seems to ignore this and continue to load HDD1! I got the Samba bit working reasonably easily. Having done that, I'd be keen to see the ME1 appear in the correct Workgroup. Currently, it appears in a Workgroup called "Workgroup". I have modified the "workgroup = " line of the smb.conf file and reset the machine, but it makes to difference. I'm not a linux expert. Is there something I need to do to make this take effect? I've tried executing "first" again. Didn't seem to make any difference.